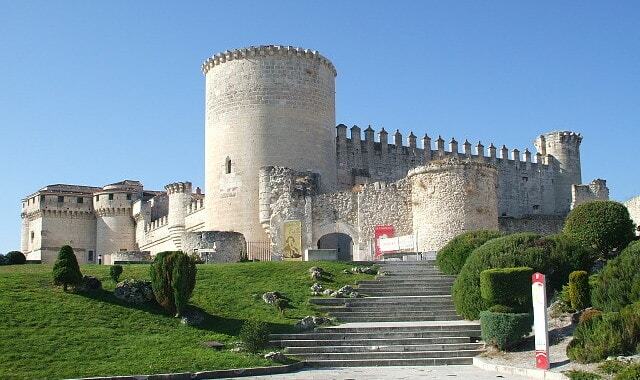 Cuellar Castle or The Castle of the Dukes of Alburquerque is an emblematic monument in the town of Cuellar, built in different architectural styles between the 13th and 18th century. The military building was extended and transformed in the 16th century, turning it into the palace of the Dukes of Alburquerque. The Dukes of Alburquerque lived in this castle for centuries until they moved to Madrid to be close to the court. Thereafter, their use of the castle was as leisure and holidays palace, abandoning the building slowly. At the late 19th century the castle was almost completely abandoned, and was victim of robberies. In 1972, the Department of Fine Arts carried out an intensive restoration, and made it the home of a Vocational Education school, which continues to this day.